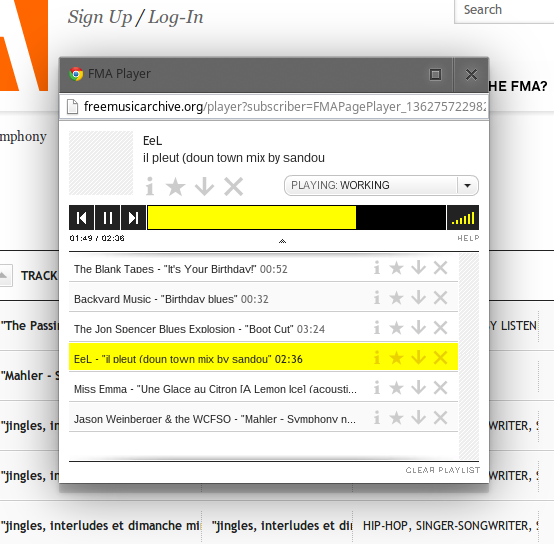 Okay, so there’s no shortage of free music available on the web, even when we don’t count all the not-so-legal stuff. Anybody with a good Internet connection can listen to (and occasionally download) just about any popular song at any time for little or no cost. “Free” in these cases means “free of cost for personal use.” And that is still very cool…radio on demand! The 21st century does not fail to impress. WFMU radio station and friends (many of them; besides curators, artists, and editors, thanks go out to the New York State Music Fund, The John D. and Catherine T. MacArthur Foundation, the National Endowment for the Arts, and many, many contributors). You can stream and download music with no account, adding tracks to a temporary playlist; signing in allows for creation of permanent playlists, mixes that can be embedded on other websites, and so on. The birthday song we all know and love? Not for public performance…so how about something like 140 CC BY alternatives? 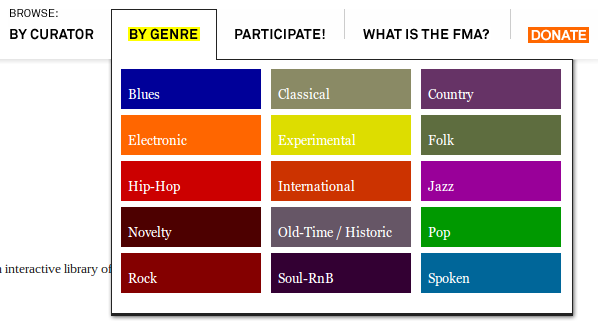 Browsing by genres — each tile brings up available sub-genres. If you know of other great openly-licensed resources, we’d love to hear (and talk) about them…let us know! Yes, FMA is a classy operation, and we’re happy to have found them and your music!